Village of Nags Head, Dolphin Run Subdivision. Access to the Village of Nags Head Beach Club with oceanfront swimming pool and tennis courts. HOT TUB, Flat-screen TVs, DVD player, video library, gas fireplace (available October – March), outside shower, grill. NON-SMOKING. NO PETS. BEDS: 1 King, 1 Queen, 2 Twins, Pyramid Bed with Full over Twin. The Beach House rental rate includes linens and towels for each room, beds made upon arrival, starter soap and toilet tissue each bath and starter soap, paper towels, and trash bag for the kitchen. 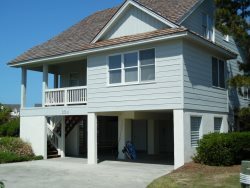 Use of the Village Beach Club is included in your vacation rental. The beach club is open from mid-May to early October. The beach club has an Olympic-size oceanfront swimming pool, kiddie pool, tennis courts, and snack bar with video games. HOT TUB, Flat-screen TVs, DVD player, video library, gas fireplace (available October – March), outside shower, grill. The Beach House rental rate includes a departure cleaning, hot tub cleaning, linens and towels for each room, beds made upon arrival, starter soap and toilet tissue each bath and starter soap, paper towels and trash bag for the kitchen.